Opportunity Knocks: Here comes the novia! Here, the word novia can mean many a things. One definition would be girlfriend. Another, fiancé, and last but not least, bride. On June 18th, I will be a novia of the final sort - that's right, a bride. If you haven't already heard the news from my oh-so-proud Grammy, or read it on my blog, Joseba and I are getting married. Our wedding will be very simple and with his family and our close friends on the beach in his small fishing village. And, although not a massive-wedding production like some weddings, this wedding was a production in itself. For me, an American, to marry Joseba, a European, it is quite a web of paperwork, meetings and loopholes that we finally surpassed and we are finally able to celebrate with some wedding rings and a toast with champagne. A long time in planning, I am so excited to share with you guys how this all came to be from the beginning to the 'I do', or as we will say in Euskera 'Nahi dut' (pronounced ny-doot). We had been talking about getting married for some time now, but the clencher was when I spent Christmas with his family. In the Basque culture, meeting the family is something that is done well into the relationship. Spending a major hoilday is big news. So, around December, it was decided and then we started looking into the rigorous process we had to start. We did some research and established that the big church wedding was not so much our style and that we would more prefer a small wedding and then a party wtih the friends and family after - and a civil wedding is what we decided on. 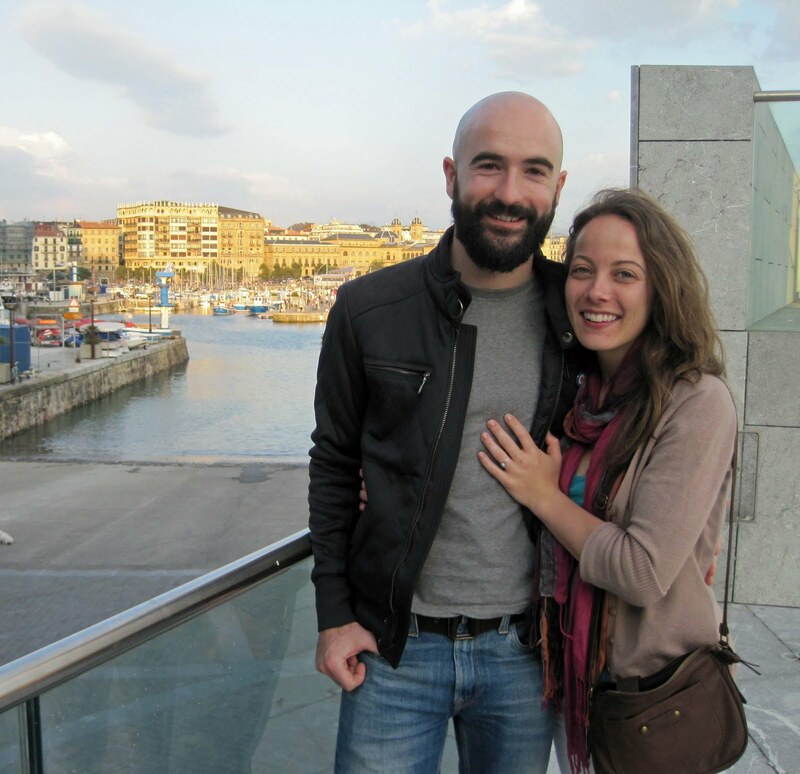 Joseba contacted his local town hall and got some information about what papers we would have to turn in for the marriage application. On his part it is easy - a copy of his identity card and his parents' names. For me on the other hand, that's where the loop jumping comes in. I would need to provide a copy of my passport (easy to get), a certificate that states I am a resident of San Sebastian (also quite easy to pass my town hall here and have them print me one), and then three trickier papers: one that states I am not married in the USA and am able to get hitched here, one that states that the American Embassy verifies I truly AM Amanda Gonser and I am not on the America's Most Wanted list, and my birth certificate. Now these things don't seem so intimidating to get on paper, but boy, to get them in my hands it was quite a chore. Let me tell you! For the 'I'm actually single and don't have a secret husband in the USA' paper, I had to go to the American Embassy in Madrid. Remember the blog I wrote about how disappointed I was about that place?! I had to fill out a few forms and swear I am single and then the Consular Office printed out and signed one measly paper that cost me $50. Same thing went for the 'I am who I say I am' paper. Another $50 bucks thank you very much. But after shelling out that dinero, I wasn't finished. I then had to run to the Spanish National Government Office to get a special stamp saying that my documents were valid. After waiting about an hour there, a friendly woman quickly stamped my papers and told me that was it. Basically, all she had to do was validate that the Consular who signed my paper was in fact the correct person to do such a job. Reading it now, it doesn't sound like such a hassle, but you know how government building visits go - soooo much waiting for so little result. But, I'll have you know, for these two leaves of paper, beside the cost, I spent about 5 hours too - super nervous hours on top of that. Regardless, I had them and was so happy that I bought myself a Starbucks and did a little dance on the street. Being it a big city, no one even noticed. On the bus back to San Sebastian, I talked to Joseba who while I had been being a good government waiter, had sent my birth certificate to a translator via email. I had had Grammy send me my original birth certificate a bit before - yellowing paper and creases that have been the same since 1984. However, it is obviously in English, which is not acceptable here - so we needed to have it translated by an Official Translator (a little more money to add to the bill). While at the Embassy however, the lady who helped me mentioned that my original birth certificate wasn't going to do - that I was going to need a 3-month new copy from my birth city and get a special seal from my Capitol. No way! Isn't the original always the best?? Apparently not. In Spain, most legal things cannot be more than 3 months old to be valid. Seeing as my birth certificate would be abouttttt 26 years old, it's a bit expired for this government. So, I looked online at Cowlitz County Health Deparment and ordered a copy of the certificate to be rush delivered to Grammy's. This alone cost about $48 (mostly the silly FedEx delivery charge). Once it arrived Grammy had to write a special piece of paper with specific instructions about what to do with said document. Another $12 had to be included for the Olympians to even look at the paper and give it it's special golden seal. That process could have taken up to a month, but luckily it arrived after only a short two weeks. THEN we had to translate it, which took about another week. When we had dotted all of our Is and crossed all the Ts, we called the Orio (Joseba's town) town hall again to set up the appointment to turn it all in and get the ball rolling. They told us that no appointment was needed but that they only work Tuesday and Thursdays from 9-1pm. Amazing work schedule eh? So, one Thursday morning we got there just as they opened and had everything organized perfectly, read to turn in. Going on thier own schedule, the slowly looked over the documetns to make sure we had everything we needed, which thank God we did! But, then they told us that there were a few more steps that we hadn't know about. With these papers, they would need to send them to San Sebastian to get them completely approved before we could get married. Also, we needed to do sign a lot of papers and do an interview. They told us to give them about a half an hour to input all of the data into the computer and come back and hopefully there wouldn't be anyone else and we could just sign the papers so they could send them off that day. So we doddled around for abotu 30 minutes and returned promptly and luckily didn't have to wait. There were so many papers to sign it was out of control, and the worst was that the man, a bit older, had read my name wrong and wrote MAYER as my middle name instead of MAYE on all the papers. So, we had to wait for him to correct them all first. When we finally got to sign the papers, each signature was like the movies - when someone is signing thier mortgage loan or something, that with each signature or stamp you get it in your head more and more that WOW THIS IS REALLY HAPPENING! With all the papers signed, they told us that they had some free time if we would just like to do the interviews that day as well. Why not?! We had already taken the morning off from work. But then it hit me, these interviews were solo interviews. Like a test to see if we we really a couple. I mean, in the USA I imagine if you marry a foreigner, the process is the same, but I guess it hadn't hit me that I would have to give an official interview, in Spanish, to test my relationship. I immediatley got super nervous and Joseba offered to go first. He was in the room with the man about 10 minutes in which time I managed to do a lot of pacing and thumb twiddling until he came out. With a desperate look I asked him what it was about he said no worries it just about us. So, in I went. And to my surprise the questions were quite simple. Question 1 being - how did we meet? Well that's easy as pie! But the thing is, that when I get nervous I become a little motor boat speaker and just talk talk talk. So after a few minutes of blabbing on about how his friend had tried to talk to me first in English and he was horrible and in swooped Joseba telling his friend sweet things to say in English that finally I started speaking with Joseba, blah blah blah, the guy stopped me and said...'So, what you mean is that you met at a party'. Basically feeding me Joseba's answer, I said 'Yes, yes, that's how we met.'. And it's TRUE but I just gave WAY more details that Joseba had. Next question what day did we meet. This was a tricky one. That party we met at was on the 19th of February, but on the 20th we went out on our first date, but this year we celebrated our 1-year anniversary on the 22nd. Worried I would say the wrong day I again blabbed about all these dates and in the end my response was: 'it was between the 19th and 22nd of February that we met', to which he said, 'oh, the 20th?' - Joseba's answer, and I agreed again. Next question, how did we decide to get married. Like I said earlier, there was no definite on-the-knee-question-popping moment, so this was a bit vague. I told him that Joseba and I had been talking about it for some time and he offered Christmas as my answer, to which I agreed. And the last question, at this point, I'm almost sweating I was so nervous, why do we want to get married. Ohhhhh. Main reason, we love each other but also a sub-reason is that as non-European there are a lot of things I am missing out on, and that being married to one would make our lives much more secure and easy. His fed answer was 'to concrete the relationship and to establish a family'. I guess that would have been a more appropriate answer, so I said yes. Phew I passed, and signed the paper swearing what I said was true and then I ran to go get Joseba. He had told me that when he was giving his interview, he was the exact opposite of my detailed explanations and had been very vague. He also said he had tried to speak loudly so I could hear and be less nervous, but as we all know, I can't hear out of my left ear, so hearing through a door is a bit tough for me. They told us that everything was finished and that they would send the paperwork to Donostia right away. They asked us if we had selected a special date for the wedding, which we hadn't and just said we would like to get married as soon as possible. They told us that as soon as the paperwork came back approved they would call us and let us know the date the Judge had open next. And then, they called! They asked us if June 18th (one week later) would be too soon! We said heck no, and started planning! And now it's only a few days away. From the mounds of paperwork to this, I am SO overjoyed to be marrying the man of my dreams and can't believe I am so lucky to have found him. I will tell you more about our plans as they happen and of course about the big day!